The Tree of Woe: Going to the dogs. Quick update: We have our bookshelves and hutch in the house now, and the 2nd floor trim is nearing completion. Despite some "hiccups" with attendance and the order of events, the current contractor is still impressing. The doors are nearing being finished, and we have our 1st floor heater back up and running. However, a couple of days ago our dryer kept tripping the breaker. Last night I went behind it to find out what was wrong. Well, turns out the power cord was shorting and just about set the whole damn thing on fire. So, we go from a package unit that almost burned the house down to a dryer that almost burned the house down. Now I know why mom says don't leave the dryer running when you're not home. Hopefully we'll be getting our cabinets, bathtub, shower, and upstairs toilet running soon. 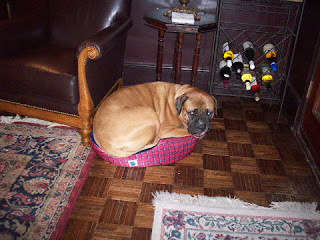 And, as appropriate for the title, a picture of our "niece" trying to "think small."